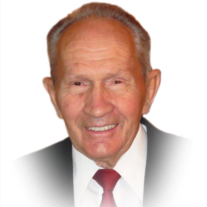 Rex Hamilton of Providence, UT, passed away peacefully surrounded by his loving wife, children and grandchildren on February 6, 2019 at the age of 89. Rex was born in Sugar City, Idaho on August 9, 1929 to Charles Orson Hamilton and Pearl Anderson. Rex served a faithful LDS mission to the Netherlands from June 1949 to December 1951 and then continued his education at Ricks College where he met his sweetheart, Maurine Merrill, from Thomas, ID. After being married in the Idaho Falls LDS temple in 1952 they settled in Sugar City, ID. In 1962 they moved to Providence where they raised their six children. Rex also built and established a successful insurance and securities business in Logan. Rex’s greatest treasures in life were his family and faith. He was adored by all as a fun, kind and loving man with a big heart. Winter was centered on skiing with family at Beaver Mountain, where he skied into his 80’s. His family will cherish the chair lift talks and the after-ski hot chocolate. Summers included pulling the family behind the boat or starting a water fight with the grandkids. Rex served faithfully in the LDS church, including a mission with Maurine to Suriname from 1996-1998 where he was a counselor in the Mission Presidency. He served for more than a decade in the Logan LDS temple and also as a Branch President to the residents of the Cache Valley Assisted Living Center. Rex had a great love of fly fishing that was developed from his youth fishing the North Fork of the Snake River in Idaho, a river he returned to often with his family. The farm from his childhood ran deep in his veins. Every summer Rex took great pride in raising a large and productive garden, with the surplus being shared and cherished by family, friends, and many neighbors. Rex entertained all with his quick wit and tall tales. We are grateful for the goodness that came into our lives because of the goodness of this wonderful man and he will be missed, but would admonish everyone to “Keep a smile”. Rex is survived by his loving wife, Maurine; his children Anette (John), Kenneth (Gina), Neil (Jeannette), Jay (Diane) and Clair (Shelley); and 22 grandchildren and 27 great grandchildren. He was preceded in death by his daughter LuAnn and two grandchildren. A viewing will be held from 6 to 8 p.m. Friday, Feb. 15 at Allen-Hall Mortuary, 34 E. Center St. in Logan. The funeral will be held Saturday, Feb. 16, at the Providence LDS 1st Ward meeting house at 420 W. 100 N, Providence at noon, preceded by a public viewing from 10:30 to 11:30 a.m. Interment will be at the Providence Cemetery. Condolences may be expressed online at www.allenmortuaries.net. In lieu of flowers, the family requests donations be made to the LDS Missionary Fund.